Kanzashipour a boho bride feather ostrich pink fascinator pin flower for a wedding, cocktail, une cérémonie, women gift, quilted bun with beads and feather. The white version is made of 2 hairpin made with feathers white and red and yellow tassels with presence of metallic thread. The diameter is 9/10 cm. Pink version: Feather flower, accompanied by a red feather down the Center peak bun made of fuchsia color ostrich feathers. The Red version: flower red feather and small black natural straw braid, Center mounted on a pic à cheveux de 6 cm. 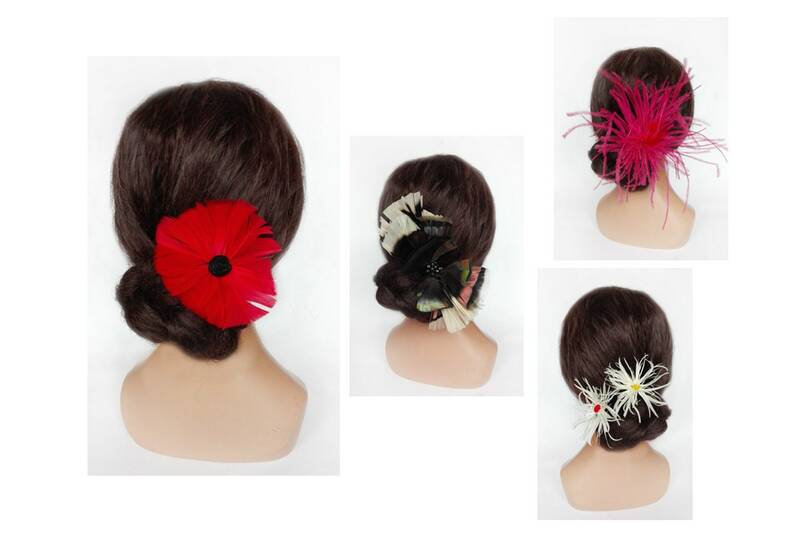 With a poppy pattern, you can adorn your hair in many occasions, for a wedding, engagement, cocktail, a party, new year, Valentine's day... or gift for a loved one suggestion. It will not leave your indifferent presence with its flaming red.